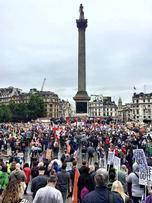 The UK saw its biggest strike this century yesterday, Thursday 10 July, as public sector workers joined together to demand better conditions. Unions affiliated to the ITF and its sister global union Public Services International (PSI), including Unite the union, the General, Municipal, Boilermakers and Allied Trade Union (GMB) and the National Union of Rail, Maritime and Transport Workers (RMT) were among the unions taking strike action. Teachers, front-line health service workers, and firefighters were also out on strike across the country. The UK government cuts programme has seen public sector workers struggle on stagnating wages while the cost of living soars. According to Unite, local government pay will soon be outstripped by the national minimum wage. Negotiations for improved pay have ended in stalemate, with public sector workers describing employer pay offers as ‘insulting’. The RMT was also involved in a dispute on behalf of its members in London. Employer Transport for London is seeking changes to pay and pensions terms and conditions, which the RMT says would see members retire to a life of poverty.